We welcome you to the CSI family! 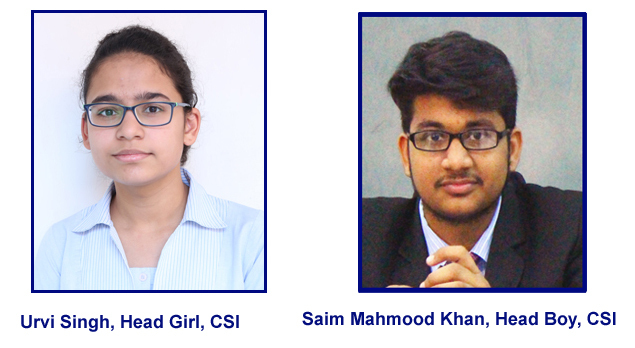 It is indeed both an honour as well as a privilege to be a part of Cambridge School Indirapuram and even more as the Head Girl and Head Boy of the School for the session 2018-19. Children form the main pivot of the Cambridge School Indirapuram and the school through its various programmes inculcates in students the ability to organize and manage. Such skills are most important for the future, which seems to be getting ever so uncertain. The school provides ample opportunities to students to embrace strengths and overcome weaknesses. It teaches children to accept appreciation with generosity and to accept criticism with optimism. The right path is not the easiest one and the willingness to take up the challenge allows us to reach the finishing line with excellence and leave a trail on the unexplored path. Getting comfortable with the uncomfortable and serving the institution with pride and honour, is our mantra to scale to new heights.